The OASE Bitron C 55 Watt UV Clarifiers with patented self-cleaning and bypass function. 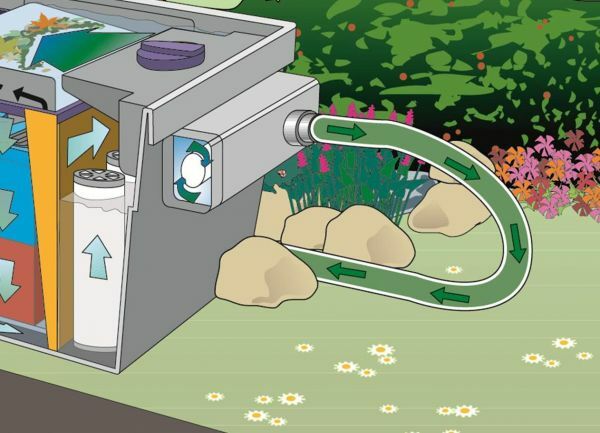 The Bitron unit "kills" algae and pathogens by UVC light rays, and causes green algae to flocculate allowing the Biotec filter to remove it from the water. The result is clear water and the re-establishment of the biological balance. Strong permanent magnets are integrated into the Bitron that prevents calcification of important functional parts and increases the efficiency of the UVC-filter by reversing the polarity of the calcium crystals. Automatic cleaning for the new Bitron C series means that a cleaning mechanism is continuously activated by the water flow around the quartz glass tube and thus directly prevents the settling of sludge and slime. The result is a UVC quartz glass tube that is always clear. This ensures that the lamp is always 100 % effective. 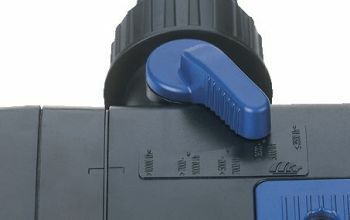 In addition, the Bitron C is equipped with one inlet and two outlets with special hose adapters up to 1 1/2“ (Bitron 36C / 55C / 72C / 110C with 2“ inlet). Optimal performance matched to the filter pump is ensured through an adjustable bypass system (Bitron 18C / 24C / 36C / 55C / 72C / 110C). The flow is adjusted by simply turning the regulators. All Bitron UVC clarifiers have an inspection window that allows convenient inspection of the UVC light tube. The indirect light is diverted in such a way that it is not harmful to the human eye. The Bitron has been designed in accordance with the highest safety standards. This has also been confirmed by the German VDE, which has tested and approved the device. The Bitron UVC clarifiers are a valuable component in OASE Biosmart, Biotec Screenmatic, Biosys and Proficlear filter systems. Inlet (x 1) connections 1", 1 1/4", 1 1/2" 3/4", 1", 1 1/4", 1 1/2", 2"
Outlet (x 2) connections 1", 1 1/4", 1 1/2"
The Bitron UV Bulb and self cleaning mechanism can be easily accessed and inspected, via the quick release button Flow rate across the UV light can be easily adjusted to achieve optimum algae "kill" rate. 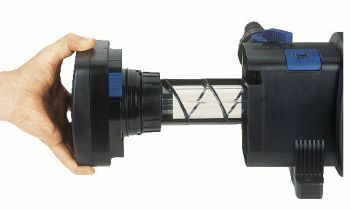 The Bitron features a self cleaning mechanism which spins in the flow of water, keeping the quartz sleeve free of debris.